Atlanta artist,graduate of the Art Institute of Chicago and the Univ. of Chicago with Honors in Figure Drawing and Figure Painting and on the Fuculty Honor Roll teaches art, paints portraits wildlife and landscapes and has new oil series: In Bloom, of large florals. Just a few months ago I started going to the figure drawing/painting class at the Atlanta Artist's Center. They are just around the corner from my studio at 2979 Grandview Ave. and I can't BELIEVE that I haven't been to this class before. Not only that, I decided to join the group...mainly because they are such a talented and friendly group of artists. I joined in time to enter their "New Members Show" and it was a good show. (At this time they are showing an national art exhibition, which you should take the time to go and see.) The AAC offers a lot of classes that are open to any artists, but you get a discount if you are a member. You are on your own in these classes. After going to this figure class for a few weeks, it seemed to me that there is a question in many beginning artist's mind regarding the approach to Gesture drawing as well as a desire to know more about rheStructure of the figure. So....I asked AAC if I could offer a figure class, using their facilities, which they encourage. Thus developed the Figure Drawing and Painting Class that I am offering at the Atlanta Artist's Center on Friday evening October 9th, When we will have a welcome with coffee and treats, then I'll do some gesture drawings, while discussing the technique, the students will then work for the rest of the time on their own gesture drawings while I go around and critique. On Saturday October 10th we'll do a few gesture drawings, after which we will settle in for a long pose. During model breaks I will discuss the muscles and "planes" of the figure. Individual instruction will be given. Members pay $105 and non-members $120. So, y'all come. You will enjoy the classes and the people and you might even learn something! 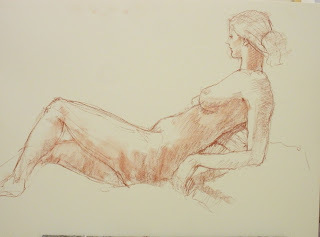 To see the invitation to the Figure Drawing Seminar, please click the link below. Sarah teaches you how to do fijures.